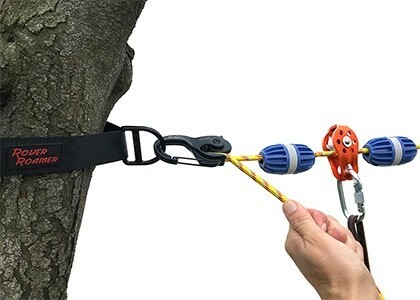 The portable Sky Track system features 8mm rope and 100% adjustable hardware, specifically designed for travel in various situations, whereas the permanent Cable Dog Run system utilizes flexi-cable line with specific hardware that requires tools to secure the line. Both are all-weather systems. Portability: take it anywhere you take your dog, from the national forests to grandma's house. Stretch and safety: rope offers stretch and flexibility and is therefore more forgiving on active dogs. Visibility: contrasting colors, phosphorescent and reflective materials for enhanced visibility from dusk to dawn. Permanence: although the Sky Track is specifically designed for the adventurer in mind, it can also be enjoyed as a permanent set-up in all weather. Similar to the Sky Track, this cable system is meant for permanent installations, featuring 1/4th" (6.35mm) aircraft cable, galvanized steel in a flexible 7x19 configuration with a clear vinyl coat, and easily modified for up to 3 dogs. Permanence: very little maintenance needed once its set up. Designed for all-weather. Cable systems are less expensive, offering a discount to those not interested in portability. Multiple anchor point hardware: use our specifically designed anchor straps to avoid drilling into trees. 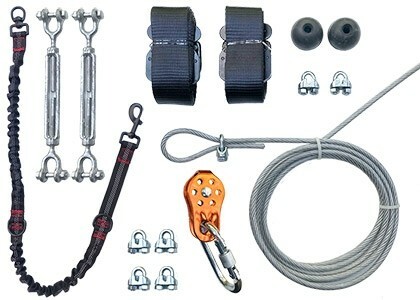 6.35mm flexible Aircraft Cable, (customize up to 500ft), 1 Pulley, 1 Carabiner, 2 Buckle straps, 1 Line tensioner, 2 Bumpers, 6 cable clamps, 1 neck-safe bungee segment, and an optional gear bag.